DIRECTIONS: This cemetery is located on Hosley Avenue in Tupper Lake. 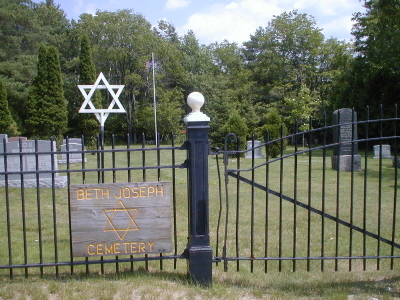 Beth Joseph is a Jewish Cemetery. This inventory was typed from a copy found at the Saranac Lake Free Library. It was compiled during the summer of 1982, author unknown. If anyone knows the author's name, please notify me so I can give credit where credit is due. It was updated and photographed by Joyce M. Ranieri on 23 July 2001. Joseph FRIEDMAN Died Dec. 6, 1921 Age 43 Y'rs. Sam FRIEDMAN Died Aug. 31, 1921 May his soul rest in peace. PVT STU ARMY TNG CORPS.